MONOJECT™ ANGEL WING™ blood collection / infusion sets with female luer attached are used for routine venipunctures and infusion applications. 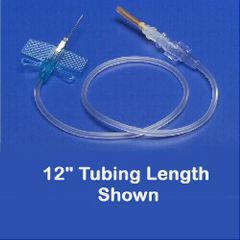 Set comprised of 23 gauge x 3/4” needle with female Luer adapter on 12” tubing. KENDALL - THE CHOICE doesn’t have to be hard. True one-handed activation of safety mechanism helps prevents accidental needlesticks. Easy-to-handle textured wings identify bevel, ease of control. Sets are Latex free thus eliminating potential allergic reactions.